Each player is at the head of a princely family. The families were ordered by the King to build magnificent buildings in the various cities and enrich them with the most unusual objects. On special occasions, the families will invite the King so that he may inspect their progress. Depending on where they built their buildings, the families will be granted coins by the King, which they will be able to use to acquire more building materials or victory points. At the end, only the family with the most victory points shall claim victory for itself! Things that I love of Palace of Carrara are: easiness to learn, replay value. 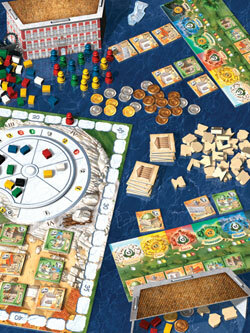 In Carrara you are one of four aristocratic families in the Italy of 16th Century or so, you are competing to gain the favour of the king through building gorgeous medieval buildings in different cities, by doing so you receive VPs, you can achieve it by different ways, either enhancing cities buildings or building motor “decks” per building type. The game gains replay-ability through a deck of cards that set the VPs criteria and ending objectives. The components are beautiful, the map, objects and tiles match perfectly to each other and theme. We had played it with my kids ( 14yo and 8 yo) several times now. its a great family game, length of play we experienced is about 45 min to 1 hours 4 players. So far I rank this game at same level to one of our favourites:Brugge. Both games share the same flavour, both are able to immerse players through time and makes you really believe you are in the renascence Italy. fully recommend it for families, if you loved Brugge, consider this as his enhanced brother. Add a Review for "The Palaces of Carrara"